HomeTravel TipsWorried About Safety In Hotels? Read 16 Hotel Safety Tips. I travel a lot; so much, that I have more hotel nights per year than nights in my bed at home. Over time, I have learned the best practices to stay safe especially when staying in hotel’s away from home, and I’m going to share some of my tips with you now. Most top hotel properties are in safe areas, but I still check the surroundings to identify areas to avoid before booking my hotel. A good example is the French Quarter in New Orleans. There are many hotels in the French Quarter and for the most part, it’s a safe area. But close by are quite a few unsafe places, especially at night. When it comes to valuables, I only take what I need. And if I don’t need an expensive item on the trip, it’s not coming with me. I view hotel rooms as public places, especially when I’m not in them. The fewer valuables I have, the better. During housekeeping hours, hotel staff is always in and out of guest rooms doing the cleaning, maintenance, and change linens. I’ve often walked down hallways during the day and counted serval rooms with doors propped open by housekeeping staff. Anyone can walk into these rooms! It’s convenient for housekeeping, but you don’t know who else is walking into your room when the door is propped open. Never say you name or room number when checking in. Most front desk staff know not to say your room number, but they do ask for your name. If you’re in a busy hotel lobby, you don’t know who’s in earshot. I don’t give the front desk staff my name verbally, but I do hand them my identification, they are going to ask for it in any case. Don’t lose sight of your luggage, especially in busy hotel lobbies in downtown areas. Hotel lobbies are very public places, and again you don’t know how is hanging around. Your room location is important in regards to staying safe. I recommend staying between the third and sixth floors. I’ve had more issues with ground floor rooms with breaking in’s through windows than I do on the higher floors. Also, ground floor rooms are closer to the more public common areas of hotels. I prefer rooms on upper floors, and near a stairwell in the case of fire. Here’s a tip bit for you, higher floor hotel rooms are cleaner than lower floor rooms. Lower floor rooms get a lot more use as they’re considered safer in the event of a fire, so more people ask for them. Don’t keep your room key in the key folder handed to you by the front desk staff. The room key folder has your room number written on it, and sometimes your last name. If you accidentally drop your key folder, and the key is in it, than anyone finding the folder can access to your room. I always leave my key folder in my room and just take the unmarked room key with me. Always lock your door and use the deadbolts or door chain when in your room. I’m astounded by the number stories I hear from people who had a stranger entered the room while they were sleeping because they didn’t lock the door. Never open the door to an unknown person. If someone claiming to be a member of the hotel staff knocks on your door, and you’re not expecting them, call the front desk. Never open the door to a stranger, and always use the door peephole to verify identity. If you have called for housekeeping, maintenance or room service, when the hotel staff arrives, always stand in the doorway with your back holding the door open while they are in your room. Remember, in hotels you are always dealing with strangers, and this is for their protection as well as yours. By holding the door open, you are giving a clear indication you won’t try anything. It also lessens your chance of being accused of something. Don’t use the guest room safe! I know this fly’s straight in the face of everything else you’ve read on the Internet, but hear me out on this one. I’m speaking from experience. Most hotel in-room safe doors are left open. Also, room safes are not securely fastened down, can be quickly removed, and their locks easily picked. Nothing screams “I’ve got to valuables inside” more than a closed and locked guest room safe! 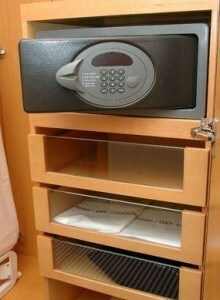 Because hotel room safes are identical to each other, it’s very easy for somebody to swap their room safe with yours. Once your room safe is in their room, they can take time picking the lock to access your valuables. 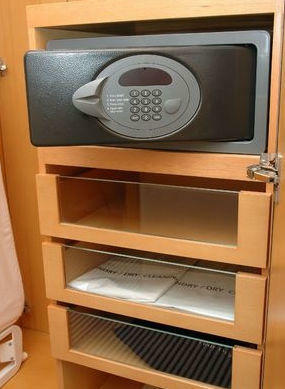 Guest room safes give a false sense of security, always ask the front desk if you can use their safe for your valuables. If you’re going to leave your room for a short period and have things out, switch on the TV and put the do not disturb sign on the outside of your door. Doing this gives the impression you’re still in the room, and there’s less chance of someone else trying to get in. For some strange reason, we overlook internet safety and security in hotels. We are all too concerned about using wireless internet in coffee shops and airports, but when it comes to our hotel rooms, we feel safe and don’t think about it. Probably because we don’t see other people and our doors are locked. The truth is we’re still using a public Wi-Fi hotspots, and we must remain diligent, if not more so at hotels than in coffee shops and airports. When connecting to the hotel Wi-Fi, always tell your computer you are on a public network. In turn, this sets your computer firewall to its maximum settings preventing intruders from gaining access to your PC, and your shared folders and files. Additionally, it is a good idea to secure your connection with a VPN service. It’s much easier for a hacker to set up an evil twin hotspot in a hotel room then it is in a coffee shop or airport. By using a VPN service, you ensure your connection is always secure. An excellent VPN service I use is PureVPN. Better yet, if your room has a wired internet connection, use it instead of Wi-Fi. 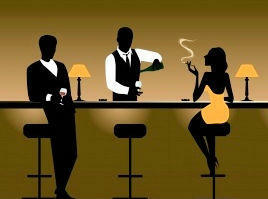 If I got $100 for each time I sat at a hotel bar and overheard someone’s name and room number; I’ll be a rich man. One night, I decided to sit at the hotel bar and count how many times I heard both the room number and name of the guest. Five times in one hour I counted, and some were women! Be safe and always write down this information for the bartender. Also, never leave you credit card sitting on top of the bar. Anyone with a smartphone can take a quick snap, and you’re none the wiser. Always read the fire safety tips on the back of the hotel room door, and memorize the fire escape plan. When the fire alarm sounds, leave! Don’t call the front desk to ask if it’s a false alarm. It amazes me how many people don’t leave the room at night when the fire alarm sounds. Yes, I agree, it may be a false alarm, but always best to leave. What if there is a real fire? If you stay in your room until you smell something burning, it may be too late for you. Do you have any hotel safety tips or suggestions? If so, please leave a comment at the end of this post. 3 Comments on Worried About Safety In Hotels? Read 16 Hotel Safety Tips. Knowing where the fire escape is would be smart for everyone staying in a hotel to know. You never know what will happen, and it is a good idea to always be prepared. That way you can ensure the safety of you and anyone with you.